Mum’s the word in Ladyville where a burglary at the residence of B.D.F. Commander David Jones has allegedly netted thieves a whopping thirty thousand dollars in cash. It hasn’t been determined when the break-in actually took place, as Jones was out of the country at the time of the incident. What we can confirm however, is that the thief gained entry into the house through the wire mesh of Jones’ home at Price Barracks. Now, one would think that the fortified compound would be free of thieves; after all, it is a secured military installation. But the army general would not be spared the sticky fingers of an enterprising soldier whom it is believed entered the quarters and helped himself to the handsome purse. Jones would not comment on record and neither would Rural Eastern Division Commander ACP Edward Broaster, suffice to say that the matter is being investigated by Ladyville Police. 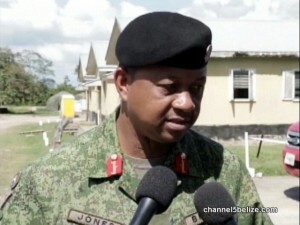 News Five understands that a soldier has been detained in connection with the daring burglary.